Final. Never count out the Zags. Gonzaga recovered from Thursday&apos;s loss to St. Marys with a 75-60 win over Santa Clara. Next game is Thursday @ Portland. Uhoh, This content has sprouted legs and trotted off. Well, 2018 arrived faster than I expected. The end of the year always brings a flurry of activites at both home and work. No resolutions for me this year - I&apos;ve never been a big fan of them. I believe that if there is something in your life that you want to change then start - don&apos;t wait until January 1st. We spent Christmas back in Montana with my paternal grandmother - she turned 93 on January 2nd so we hung around to have a small party for her. She&apos;s doing great, still lives on her own but doesn&apos;t drive any longer. It was cold there - it got as low as -31F (before the wind chill on New Years Day, so needless to say we didn&apos;t spend much time outside this trip. As far as the NFL goes and SuperBowl 52... I&apos;m rooting for the @Vikings - with the @Seahawks missing the playoffs for the first time in 5 years, I wasn&apos;t extremely excited about post-season football but there have been some really good games and it would be cool to see Minnesota win it all in their beautiful new stadium! Game 1 of the Battle4Atlantis is in the books and the Bulldogs beat the Huskies in a great game to start this tournament. Wiltjer and Sabonis led Gonzaga in scoring. This is going to be a great three days of experience for the young Huskies and I can't wait to see how they develop over the season. Looking forward to this season, especially the “Battle in Seattle game against Tennessee! North Dakota State played a great game and gavotte Gonzaga Bulldogs a handful for most of the game. 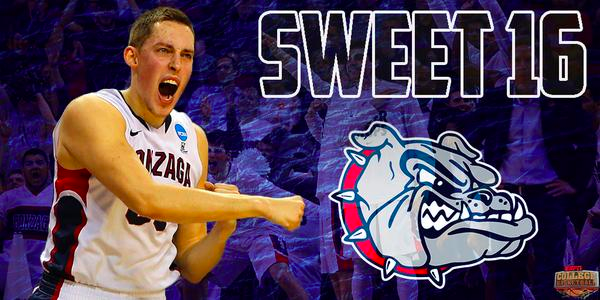 Gonzaga will play Iowa on Sunday to get to the Sweet 16.